One thing has stayed consistent throughout John Petrucci’s long and successful career: the DiMarzio® pickups in his guitars. John has been pushing the envelope of progressive metal since the late eighties, and the new DiMarzio® Crunch Lab 7™ Bridge Model ensued from our most recent collaboration with John. He used it throughout Dream Theater’s tenth studio album, “Black Clouds & Silver Linings”. John swears this is the best live and studio sound he has ever had, and the name says it all — “crunch” is what it’s all about with a big, tight sound that’s neither muddy nor thin. The Crunch Lab 7™ is noteworthy (bad pun alert) for what it doesn’t do — it’s not a screamer, and it’s not about thundering lows. Its physical appearance is identical to the D Sonic 7™, but the internal design is a lot different. It’s louder, and the highs have more depth. The lows and mids are more open, and this is crucial for playing chords with body and presence through a gained-out amp. 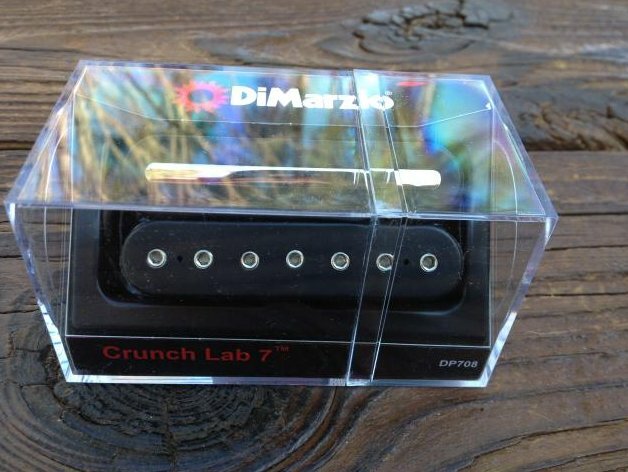 The way the pickup attacks a note is both sharper and stronger, and this allows the Crunch Lab 7™ to be installed with the solid bar towards the neck.